Sunday February 17th 1878 I helped do up the work this morning and Mollie and I went to church. Mr Griffen preached an excellent sermon about heaven. When the dinner work was done up I wrote my diary and read a little. In the evening I wrote to Charlie, Pete, and a postal to Aunty. Weather rather pleasant. Monday February 18th 1878 Hattie did the washing this morning and I give the house a good cleaning up. Mother went to town in the afternoon and I worked till late bed time on my tidy. Esther and Will with Henry Hart and Eugene spent the evening here. Hattie was away. 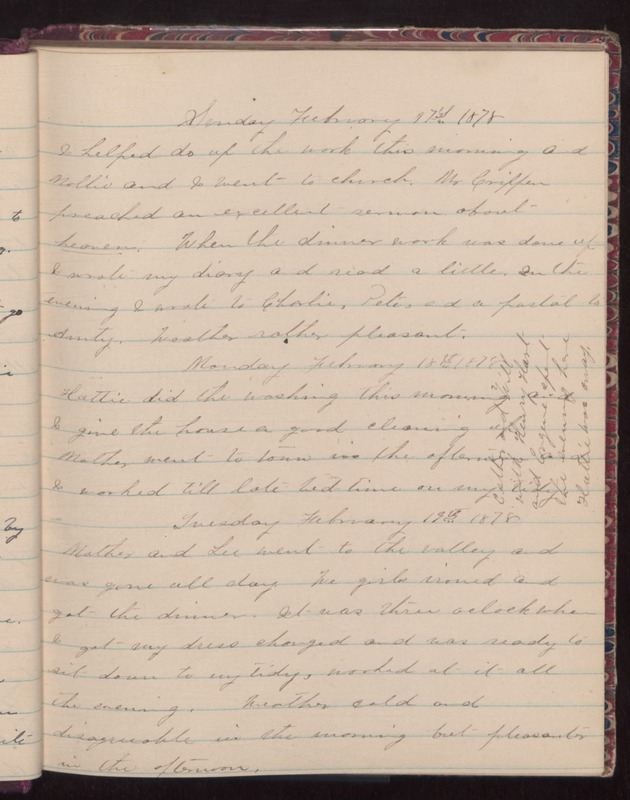 Tuesday February 19th 1878 Mother and Lee went to the valley and was gone all day. We girls ironed and got the dinner. It was three oclock when I got my dress changed and was ready to sit down to my tidy, worked at it all the evening. Weather cold and disagreeable in the morning but pleasant in the afternoon.